The largest and most affordable Online MTB Frames Shop! MTB Frame shop the largest and most affordable! Do you want to buy an MTB Frame online? Hollandbikeshop.com has the MTB Frames you're looking for. The mountainbike frame is probably the most important part of the bike. It should be stable, but preferably also lightweight. This way the mountain bike can carry additional weight without swaying, while the weight of the frame doesn't prevent you from accelerating, like when you're climbing a steep hill. At Hollandbikeshop.com you can find a wide range of MTB Frames by brands like Astro, Forebikes and Montano. We advise you to thoroughly check which size and type of frame you need, since not every mountain bike frame is compatible with a suspension fork. 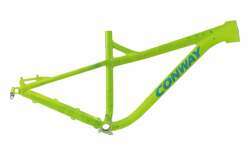 In our wide range of Mountain Bike Frames on Hollandbikeshop.com you can find frames for the mountain bike in various colors, sizes and models, like very robust and stiff aluminum mountain bike frames, which can be chromed or anodized. So you'll surely find the MTB Frame you are looking for! Hollandbikeshop.com is dealer of MTB Frames and has a large and affordable range. We also often have MTB Frames on sale or in our outlet, so keep an eye on our sale button. The largest and most affordable online MTB Frame shop!